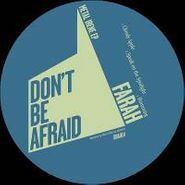 Darling Farah comes with grittier than typical sounds for the Don't Be Afraid label. Opener "Cloudy Apple" is gloomy, hypnogogic techno. "Speak on the Spotlight" is perhaps the most playable track on the record, with some moody, distant chords serving as a bed for a sweet/sour pair of vocal samples. "Humming" is a dramatic drone piece and closer "Lockhead" builds a swinging rhythm under a clipping sawtooth bassline. Recommended.